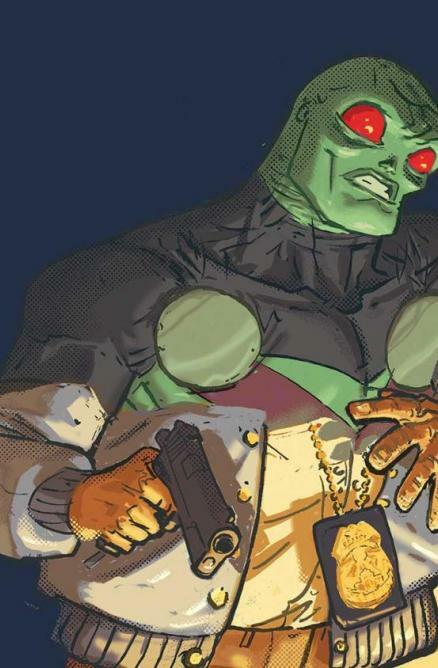 Steve Orlando really is breaking new ground here with this new Martian Manhunter maxi-series, as the character’s backstory has never really been given this sort of attention at the ground level. We finally get to witness what kind of person J’on J’onzz was before he became the wise guru and informational officer of the Justice League, and just what he and the other Martians were up to when their world went up in flames. The question then is: does any of this make any sense? One of more difficult things to do when writing alien culture in anything is retaining a sort of readability while still exemplifying just how alien that world really is to our own. Orlando ultimately struggles to keep things focused in a narrative sense while visiting Mars in the flashback moments due to just how much he relies of confusing space jargon and alien cultural elements to carry the narrative. I found it difficult at times to really grasp the significance of the Martian conflict. While the danger of their inevitable demise (if you know anything about the history of the character, you know that Mars doesn’t stay so terribly populated for long) is shown here and is made somewhat clear, the gravity of the situation is hidden behind unmemorable alien phrasing and facial expressions. The current story, as in the present day Earth where he’s crashed his car into the tree, doesn’t really make any real movements here. The entire issue relies heavily on the Martian flashbacks and suffers from a lack of progression. We’re only getting twelve issues, and I’m much more anxious to see how this murder mystery plays out and what it all really has to do with J’on’s Martian history. While the socio-political landscape of Mars and J’on’s history with it is likely to play a key role in this retelling, this issue stayed in the past for longer than was necessary. The art by Riley Rossmo is interesting, with a certain cartoonish charm really making this book fun to look at. All of the Martian landscapes are wacky and the alien designs bizarre. The sheer joy of looking at this book more than carried me through to the final page, despite any narrative hang-ups. My one complaint, as I mentioned above, is that the facial expressions on some of the characters are somewhat hard to follow, relying on emotive, cartoonish extremes that betray some of the subtleties in the text. Overall, the book manages to move things along, albeit at a snail's pace. J’on J’onzz is one of the more recently ignored characters in the DC Universe, so it’s nice to see him getting some attention. Here’s to hoping for some major movements and character developments in the coming issues.